Why us this entrance so rough looking? This is actually the entrance of the forced passage. The original entrance is over there, to the left of the forced entrance. It is that aperture beneath the huge limestone gables. Why didn't they use the original entrance , which is only a very short distance fro the forced entry? The true entrance was covered with stone blocks for thousands of years, and therefor was invisible. People had been trying to enter the pyramid, for thousands o years, looking for possible gold and treasures. 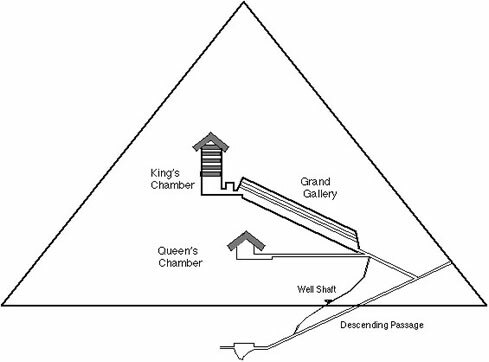 The Arab Caliph, Al Mamun, in the ninth century, unaware of the original entrance, forced his way through the solid stone in he sixth of masonry, which led him to the first interior passage of the pyramid , Only then , by tracking the interior passage, was he able to find the location of the true original entrance. The stone blocks, covering the entrance were then moved. That must have been hard work , for Al Mamun, to cut through the stones. It sure looks like it . The passage which Al Mamun cut was 118' (36m) long before he reached the junction of the original descending and ascending passages. Are you saying nobody before Al Mamun had access to the interior of the Pyramid ? That's correct. There is no evidence whatsoever, either on the outer surfaces of the pyramid or inside it, that suggests that someone had broken into the pyramids earlier. Did any ancient historian refer to the interior passageways? No , Herodotus never mentioned any passages. His Egyptian sources , around 500B.C., never mentioned them.